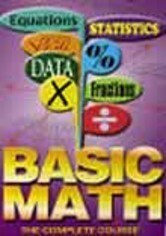 Math wizard Dr. Murray Siegel demonstrates how to solve simple linear equations with one variable in this volume of the Basic Math series. He also teaches students the foundations and importance of algebra. Lessons gradually become more complex, and by the end of the program, students are able to, with confidence, add and subtract whole numbers and check their answers by using the original equation.